alaTest zebrał i przeanalizował 259 opinii użytkowników z magazynów i stron. Ludziom podoba się cena i jakość obrazu. Przenośność jest również bardzo dobra. Oceniający mają wątpliwości co do pamięci. Eksperci oceniają ten produkt na 81/100 a użytkownicy na 88/100. Przeanalizowaliśmy te oceny, wiek produktu i inne czynniki. W porównaniu do innych produktów z kategorii Kamery wideo, GoPro Hero 5 Session uzyskał ogólny alaScore™ 98/100 = jakość Celująca. After fumbling on price with the original Hero Session, GoPro put in some solid upgrades to make round two immediately more appealing. The GoPro Hero5 Session is a big improvement in video and photo quality from the original Hero Session. Additions like voice control, electronic video stabilization and USB-C help justify the $100 price difference. You'll have to connect to a phone or tablet to see what you're shooting. The built-in battery means that once the battery is drained, you'll have to stop to charge or connect to a power source to keep recording. 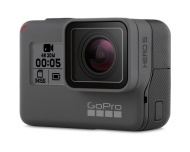 With the Hero5 Session, GoPro adds 4K video recording to an impressively tiny midrange action camera. Records 4K footage. Excellent video quality for the size. Waterproof without a case. No viewfinder. Awkward controls. No external mic support without an adapter. GoPro's Session camera got off to a rocky start.